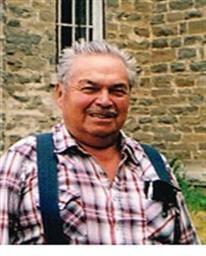 Passed away in his home community of Cape Croker on Monday, March 25, 2013. Charles Richard Jones at the age of 80 years. Loving husband to the Verlyn Akiwenzie-Jones. Cherished father of Rhonda and Brian Pedoniquotte, Charles and Rachel Jones, Orland and Monique Jones, Blake and Vanessa Jones, Rhoda Nadjiwon(Wendall), Yolanda Jones-McDonald, Leighton and Patricia Jones, Jenny and Doug Abel, Danny and Michelle Jones Peter and Vanessa Thied, and Angela and Kevin Lewis. Richard was blessed with 41 grandchildren and 21 great-grandchildren. Richard is survived by sisters Gina and Danny Roach, and Trudy and Bill Syrette; and sister-in-law Suzelle Jones. He is predeceased by his parents Alfred and Rena; brothers Ken Jones, Edward Jones, Fred Jones and Wayne Jones; and a sister-in-law Edwina Moyer. Family invite you to gather with them for visitation on Wednesday from 7-9 pm and Thursday from 2-4 and 7-9 pm at the Cape Croker Community Centre, Cape Croker. A service to celebrate Richard's life will be conducted from the Cape Croker United Church on Friday, March 29, 2013 at 11 o'clock. Interment in Little Port Elgin Cemetery. Donations to the Heart and Stroke Foundation or to the Wiarton Hospital would be appreciated. Arrangements entrusted to the Thomas C. Whitcroft Funeral Home & Chapel, 814 Bruce Rd. 8, Sauble Beach (519) 422-0041.